Set 12 of Verso's long-running Radical Thinkers series is out this week. Below, we present an excerpt from "History or Technological Determinism? 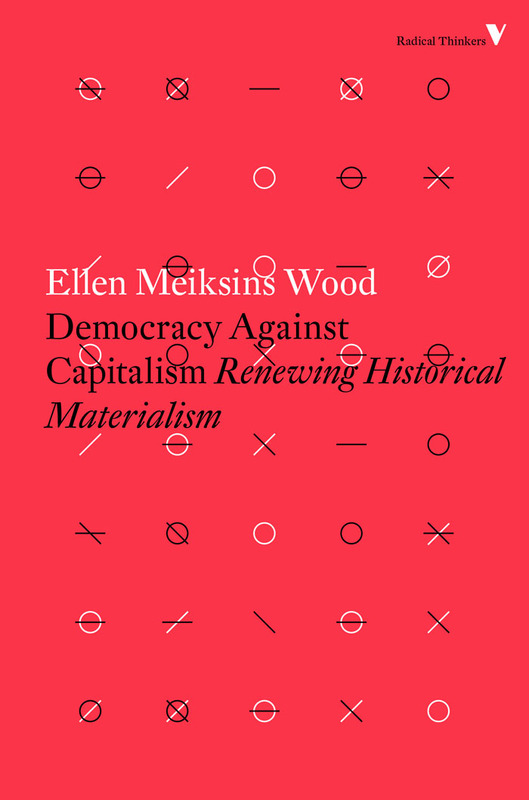 ", a chapter in Ellen Meiksins Wood's Democracy Against Capitalism. We need to be reminded why Marxism ascribes a determinative primacy to class struggle. It is not because class is the only form of oppression or even the most frequent, consistent, or violent source of social conflict, but rather because its terrain is the social organization of production which creates the material conditions of existence itself. The first principle of historical materialism is not class or class struggle, but the organization of material life and social reproduction. Class enters the picture when access to the conditions of existence and to the means of appropriation are organized in class ways, that is, when some people are systematically compelled by differential access to the means of production or appropriation to transfer surplus labour to others. The compulsion to transfer surplus labour can take different forms, with varying degrees of transparency. Capitalism undoubtedly represents a special case, because capitalist appropriation is not a distinctly visible act – like, say, the serf's payment of dues to the lord, which constitutes a separate act of appropriation, after the fact of the serf's labour and in the context of a transparent relationship between appropriator and producer. In contrast, there is no immediately obvious way of separating the act of capitalist appropriation from the process of production or from the process of commodity exchange through which capital realizes its gains. The concept of surplus value – as distinct from the more general category of surplus labour, which applies to all forms of surplus appropriation – is meant to convey this complex relation between production, realization in commodity exchange and capitalist appropriation. There has been no shortage of critics, including Marxist economists, who have been keen to point out the difficulty of explaining these relations in quantitative terms – that is, of measuring ‘value' and ‘surplus’, or of relating ‘value’ to ‘price’. It is unlikely that Marx's concept of surplus labour or surplus value was ever intended to provide the kind of mathematical measure these critics require; but, in any case, this shortcoming – if shortcoming it is – has no bearing on the historical significance of ‘surplus labour’. The fundamental insight encased in this concept concerns the conditions in which people have access to the means of subsistence and reproduction and the proposition that a decisive historic break occurs when the prevailing conditions systematically compel some to transfer part of their labour or its product to others. The critical datum in explaining the role of class in history is not, then, the quantitative measure of the ‘surplus’ but the specific nature of the compulsion to transfer it and the specific nature of the social relation in which that transfer takes place." In cases where direct producers – like feudal peasants – remain in possession of the means of production, the transfer of surplus is determined by direct coercion, by means of the appropriator's superior force. In capitalism, the compulsion is of a different kind. The direct producer's obligation to forfeit surplus is a pre-condition for access to the means of production, the means of sustaining life itself. What compels direct producers to produce more than they will themselves consume, and to transfer the surplus to someone else, is the ‘economic necessity which makes their own subsistence inseparable from that transfer of surplus labour. Wage labourers in capitalism, lacking the means to carry on their own labour, only acquire them by entering into a relationship with capital. This need not, of course, mean that those who are obliged to transfer surplus labour will get only the bare necessities; it simply means that the transfer is a necessary condition for their access to the means of survival and reproduction – and whatever they can acquire above and beyond that with those means. Such relations can be shown to exist even in the absence of any means of quantifying a ‘surplus' or measuring the relative gains of producers and appropriators. We need only acknowledge that the producer's self-reproduction has among its necessary conditions a relation to an appropriator who claims part of his or her labour or product. It is no doubt possible to identify transfers of surplus labour which are not determined by coercive imperatives (e.g., gifts, the fulfilment of kinship obligations), but these are not the kind to which the concept of class specifically refers. It is also important to acknowledge that class may not always entail direct relationships, in the sense of face-to-face confrontations, between exploiter and exploited, and that in the absence of such confrontations, class relations may not generate conflict as readily as other, more direct non-class antagonisms may do. But class conflict has a particular historical resonance because it implicates the social organization of production, the very basis of material existence. Class struggle has a distinctive potential as a transformative force because, whatever the immediate motivations of any particular class conflict, the terrain of struggle is strategically situated at the heart of social existence. How, then, do relations between producers and appropriators figure in the materialist explanation of historical movement? I shall distinguish between two broad categories of Marxist explanation, illustrated by two of their most important recent exponents. The first situates production relations and class within a larger, transhistorical context of technological development. The other seeks specific principles of motion in every social form and its dominant social property relations. The distinction I am drawing is not simply that between Marxist theories which give primacy to ‘forces of production’ and those that give priority to ‘relations of production’ and class struggle. Instead, I want to emphasize the difference between theories that posit some general, transhistorical and universal law of historical change – which invariably means some kind of technological determinism — and those that stress the specificity of every social form – which generally means an exploration of the specific ‘laws of motion’ set in train by the prevailing social relations between appropriators and producers. Two especially important examples from recent Marxist scholarship will suffice to illustrate the point. From their respective theoretical vantage points, both offer an account of the major historical transformation that has preoccupied Marxist historians, the transition from feudalism to capitalism. The first comes from the influential school of ‘Rational Choice Marxism’, in the person of John Roemer, who has joined his distinctive theory of exploitation and class with a theory of history indebted to G.A. Cohen's powerful defence of Marxism conceived as a technological determinism.” The other example is the Marxist historian Robert Brenner and his work on the origins of capitalism. We now have three levels of explanation: (1) the deep cause (technological determinism); (2) the historical process (the successive elimination of forms of exploitation or the progressive socialization of property); (3) the ‘facilitator’ (class struggle – though this only ‘facilitates’ a process that was ‘bound to come sooner or later”). It is not entirely clear at what level the ‘rational choice’ model should be introduced. The most obvious place is in class struggle, which implies that change occurs when (if not because) people are in a position to choose the available option of the next, more progressive mode of production. At the same time, there appears to be an overarching rational choice, at the level of the deep cause, having to do with ‘the ceaseless effort of rational human beings to alleviate their conditions of scarcity” – though they do not actually choose the next available economic structure because it is conducive to technological progress. In either case, the necessary link between the rational-choice model and the theory of history is the presupposition that there is a direct correspondence between the self-interested actions of individual rational actors and the requirements of technical progress and economic growth. This three-layered structure raises rather more questions than it answers, not least about the connections among its three levels. Are rational individuals, insofar as they are the makers of history (but are they? ), motivated by the desire to alleviate scarcity through technological improvement or by the wish to escape exploitation – or neither? Is class struggle necessary or not; and if not, what is the mechanism of historical change? Or does the deep cause somehow make mechanisms and facilitators redundant, since change is somehow ‘bound to come sooner or later’ anyway, behind the backs of rational individuals? And where, in any case, is the struggle in class struggle? We have lords and capitalists competing to give more attractive terms to producers, to serfs who might want to become proletarians; and we have serfs escaping from lords – apparently without constraints, and willingly giving up their rights of possession – as soon as a more attractive option comes along; but struggle. ...? What, indeed, is the ‘economic advantage’ that would impel serfs to prefer a wage which, by some sophisticated statistical measure, was higher than their ‘earnings' as serfs, at the cost of losing their rights of possession, giving up the land which provides them with full and direct access to the means of subsistence in exchange for the uncertainties of the proletarian condition? For that matter, even if serfs choose this option, how do they manage to achieve it? If the lords' property ‘rights’ in the labour of others have anything to do with the ‘control’ – i.e., the power – that they exercise over the serfs, how is it that when the critical moment of transition comes, serfs can simply choose to escape the lord’s control just because a more eligible option has presented itself? Has feudalism no self-sustaining logic and resources of its own to resist this easy transition? All this is quite apart from the fact that the whole edifice is constructed without benefit of evidence. Roemer has chosen his words carefully when he asks us to ‘imagine'. We can hardly do anything else. (‘Imagine’ and ‘suppose' are the basic vocabulary of this game-theoretic discourse.) We are not (or not always) being asked to believe that this is how things actually happened, or even that it was historically possible for them to happen in this way, only that it is logically conceivable that they did (though it is never made clear why we should be interested in such imaginary logical possibilities). Indeed, it is very unlikely that Roemer himself believes his own imaginary account of the transition to capitalism; and it is a measure of the price exacted by his game-theoretic model that it obliges him to set aside everything he undoubtedly knows about the power relations between lords and serfs, the dispossession of small producers and the concentration of landlordly property which were the conditions of the transition; everything, that is, about coercion, compulsion, imperatives, or indeed about the social relations of exploitation. This process of transition which Roemer asks us to ‘imagine’ evidently has little to do with history, and it would serve no purpose to counter this imaginary story with evidence. History is, apparently, a subject about which we can say anything we like. He goes on to characterize this interpretation as ‘a translation of the technological determinist aspect of historical materialist theory into the language of the theory of exploitation’. According to this interpretation of historical materialism, all successive forms of exploitation are already contained in the preceding ones (his account of the progress from slave society to capitalism suggests that this retrospective analysis goes back beyond feudalism), so that all forms of exploitation which have emerged in the course of history have apparently been present since the beginning; and history proceeds by the process of elimination. Each form of exploitation is in turn eliminated as it obstructs the development of productive forces. In this sense, technological determinism, for Roemer, supplies the mechanism (deep cause?) of elimination. But the irreducible first premise of the argument is that each successive social form exists simultaneously with the one that precedes it. In this respect, Roemer's theory of elimination is simply a more ingenious variation on an old theme. It has been a favourite ploy of theorists who have trouble with process to beg the question of history by assuming that all historical stages – and especially capitalism — have in effect existed, at least as recessive traits, since the beginning. Such accounts of history typically invoke some deus ex machina, some external factor,to explain the process that brings these recessive or embryonic traits to fruition. Traditionally the most popular ‘external’ forces have been trade (markets enlarging and contracting, with trade routes opening and closing) and/or technical progress, both conceived as exogenous to the systems being transformed, either in the sense that they are determined by alien intrusions such as barbarian invasions, or in the sense that they operate according to some universal natural law (progress, the natural development of the human mind, or perhaps, more scientifically, demographic cycles) not specific or intrinsic to the existing social form. Assumptions such as these have been a staple of bourgeois ideology, which I shall take up in a subsequent chapter. For the moment, it is enough to note that Marxists too have often gone in for this kind of thing by conjuring up images of aspirant modes of production lurking in the interstices of previous ones, waiting only for the opportunity to establish their dominance’ when certain obstacles are removed (it seems so much easier somehow to account for the demise of what already exists than to explain its coming into being). The Althusserian concept of ‘social formation', for example, in which any and all modes of production can coexist without any need to explain their emergence, serves exactly this purpose. There can be no doubt that this kind of conceptual conjuring has far too often served in place of a Marxist theory of history; and, no doubt, Marx’s more formulaic aphorisms about the stages of history and successive modes of production could be read as invitations to evade the issue of historical processes in this way. It was Marx, after all, who first spoke of “fetters” and “interstices.” But there is much more in Marx which demands that we look for the key to historical change in the dynamic logic of existing social relations without assuming the very thing that needs to be explained. Robert Brenner's primary purpose has been to break the prevailing habit of begging the central historical question, the practice of assuming the existence of the very thing whose emergence needs to be explained. He distinguishes between two kinds of historical theories in Marx's own work, the first still heavily reliant on the mechanical materialism and economic determinism of the eighteenth-century Enlightenment, the second emerging out of Marx's mature critique of classical political economy. The first is characterized by its begging of the question, invoking the self-development of productive forces via the division of labour which evolves in response to expanding markets, a ‘nascent capitalism in the womb of feudal society. Later, Marx was to pose the question very differently. He substantially revised his views on property relations in general and pre-capitalist property relations in particular: “In the Grundrisse and Capital, Marx defines property relations as, in the first instance, the relationships of the direct producers to the means of production and to one another which allow them to reproduce themselves as they were. By this account, what distinguishes pre-capitalist property relations ... is that they provided the direct producers with the full means of reproduction.” The condition for maintaining this possession was the peasant community, and its consequence was that the lords required ‘extra-economic’ means of taking a surplus, which in turn demanded the reproduction of their own communities. The structure of these property relations was thus reproduced by communities of rulers and cultivators which made possible the economic reproduction of their individual members'." Given these property relations, reproduced by communities of rulers and direct producers in conflict, the individual lords and individual peasants adopted the economic strategies that would best maintain and improve their situation – what Brenner calls their rules for reproduction. The aggregate result of these strategies was the characteristic feudal pattern of development. The transition to a new society with new developmental patterns thus entailed not simply a shift from one mode of production to another alternative mode, but a transformation of existing property relations, from feudal rules of reproduction to new, capitalist rules. According to these new rules, the separation of direct producers from the means of production, and the end of ‘extra-economic' modes of extraction, would leave both appropriators and producers subject to competition, and able – indeed obliged – to move in response to the requirements of profitability under competitive pressures. This inevitably raised a new and different question about the transition from feudalism to capitalism: “it was the problem of accounting for the transformation of pre-capitalist property relations into capitalist property relations via the action of pre-capitalist society itself’." This is the challenge that Brenner has taken up: to offer an explanation of the transition to capitalism which relies entirely on the dynamics of feudal relations, and their conditions of reproduction, without reading capitalism back into its predecessor or presenting it as an available option.” This project also requires an acknowledgement that pre-capitalist property relations have a logic and tenacity of their own, which cannot be conjured away by the convenient assumption that people are driven by an urge to take the next available (capitalist) option, an urge that existing structures cannot resist. This is something that Roemer’s model is systematically unable to take into account; and, in this respect, it is no different from a long tradition going back to Adam Smith, a tradition that has included Marxists (indeed, the young Marx himself) as well as non-Marxists. It has, in fact, been the rule rather than the exception to assume the existence of capitalism in order to explain its coming into being, to explain the transition from feudalism to capitalism by already assuming capitalist structures and capitalist motivations. But the relations of capitalism and the associated compulsions of capital accumulation, the specific logic of capitalism and its systemic imperatives, can in no way be deduced from the dominant relations of feudalism nor discovered in its ‘interstices’. Nor can the relations and imperatives of capitalism be deduced from the mere existence of towns, on the assumption – unwarranted both logically and historically – that towns are by nature capitalist. There will be more on the subject of towns, capitalism and the begging of historical questions in the next chapter. Here, we need simply to take note of the differences between Brenner and Roemer and the implications they have for the Marxist theory of history. First, the empirical differences: Brenner's history of capitalist development puts in question nearly every point in Roemer’s imaginary scenario. Capitalism does not, in his account, simply exist, miraculously, alongside the feudal economy, nor is it here a product of mercantile interests in the towns competing with feudal interests in the countryside. Direct producers do not join the capitalist economy by fleeing the countryside to become artisans or proletarians. While the development of capitalism certainly presupposes the existence of markets and trade, there is no warrant for assuming that markets and trade, which have existed throughout recorded history, are inherently, or even tendentially, capitalist. In Brenner's account, the transition to a distinctively capitalist form of society is a process set in train by the transformation of agrarian relations themselves, in particular conditions which have little to do with the mere expansion of trade. Indeed, this account (like others in the famous ‘Transition Debate”) begins by casting doubt on the inherent antagonism of markets and trade to the feudal order. It is not capitalism or the market as an ‘option’ or opportunity that needs to be explained, but the emergence of capitalism and the capitalist market as an imperative. Brenner gives an account of the very special conditions in which direct producers in the countryside were subjected to market imperatives, rather than the emergence of ‘options' for direct producers, opportunities offered them by trading interests in the towns. In the traditional models of technological determinism and ‘bourgeois revolution’, together with their non-Marxist counterparts, an already present capitalist society simply grows to maturity. In Brenner's model, “one type of society is transformed into another'. The point is not that city is replaced by countryside in his analysis nor that trade and commerce play only a marginal role but rather that Brenner acknowledges the specificity of capitalism and its distinctive ‘laws of motion’, which also means acknowledging the necessity of explaining how trade and commerce (not to mention cities), which have existed throughout recorded history, became something other than they had always been. It goes without saying that the existence of cities and traditional forms of trade throughout Europe (and elsewhere) was a necessary condition for England’s specific pattern of development, but to say this is far from explaining how they acquired a distinctively capitalist dynamic. Brenner has yet to explain the role of cities and the urban economy in European economic development; but, by explaining how the market acquired a qualitatively new role in agrarian production relations, as direct producers were deprived of non-market access to the means of their own self-reproduction, he has established the context in which the systemic role of cities and trade was transformed. This account has significant theoretical implications, especially in challenging the assumptions of technological determinism. Brenner's history suggests that there is no historical necessity for less productive ‘economic structures’ to be followed by more productive ones and stresses the historical specificity of the conditions in which the process of ‘self-sustaining’ growth was first established. Roemer's response to this challenge is simply that capitalism did eventually spread to other parts of Europe, even if it first emerged in England, so that Brenner's evidence does not contradict Cohen’s version of historical materialism, with its universal law of technological determinism. But quite apart from its cavalier treatment of historical time, and a similar treatment of geographical space, this response depends on treating the historically specific process of capitalist expansion, a priori, as a transhistorical law of nature. When Roemer invokes the universality of capitalist development, at least its eventual spread to other parts of Europe, he takes it for granted that this bespeaks a universal process of technological advance. Yet this simply begs the question. Capitalism itself has, since its inception, displayed a distinctive capacity for expansion and universalization, a capacity rooted in its specific pressures for accumulation, competition and the improvement of labour productivity. The point of Brenner's argument, in contrast to technological determinism, is to avoid simply taking for granted the universal development of capitalism by subsuming it under some universal law of technological change, and instead to explain how historically specific conditions produced capitalism's unique technological imperatives and its unique expansionist drive. It is one thing to say that capitalism uniquely fosters technological development. It is quite another to contend that capitalism developed because it fosters technological development, or that capitalism had to develop because history somehow requires the development of productive forces, or that less productive systems are necessarily followed by more productive ones, or that the development of productive forces is the only available principle of historical movement from one mode of production to another. Once the specific imperative of capitalism to improve the forces of production is conceded – as it is by even the most uncompromising technological determinist – it seems both more efficient (on the principle of Ockham's razor) and less question begging to say that the universality of capitalism demonstrates the specificity of its drive to improve productive forces, its competitive and expansionist drive and capacity, rather than the generality of technological determinism. This proposition is, at any rate, more consistent with the variety of developmental patterns which have manifested themselves throughout history. The most distinctive feature of historical materialism – that which distinguishes it most radically, in form as well as substance, from conventional ‘bourgeois' theories of progress – is not its adherence to a general law of technological determinism. It is, rather, a focus (such as that which characterizes the most complete and systematic of Marx's own works, his actual practice in the critique of political economy and the analysis of capitalism) on the specificity of every mode of production, its endogenous logic of process, its own ‘laws of motion’, its characteristic crises – or, to use Brenner's formula, its own rules for reproduction. This is not simply a matter of distinguishing between a ‘general theory’ of history and a ‘special’ theory of capitalism. It is rather a different (and general) theory of history of which the theory of capitalism, with its specific laws of motion, is the prime example. While technological determinism takes the form of retrospective or even teleological predictions, with the benefit of hindsight, with such a degree of generality that no empirical evidence could possibly falsify it, historical materialism demands empirical specification which does not assume a predetermined outcome. But if the mark of a theory is the existence of ‘fixed points’ which remain constant throughout its specific applications, there are more than enough fixed points here – in particular, the principle that at the foundation of every social form there are property relations whose conditions of reproduction structure social and historical processes. The Radical Thinkers edition of Democracy Against Capitalism is available here.